Supergirl showed us how the other half lives in “The House of L,” which covered three years’ worth of narrative ground to explain how Lex (guest star Jon Cryer) came to work with Eve Teschmacher, Otis Graves, and his very own Red Daughter. 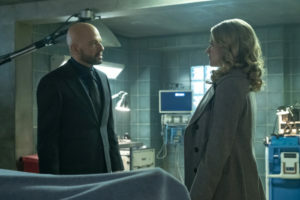 All to arrive at the moment where Lex towers over Kara (Melissa Benoist) with Harun-El coursing through his currently superpowered veins, of course. Dare I say she was a nice girl before this mess? Three years ago, Lex was on trial for that Red Sun incident that we glimpsed last week. Lena (Katie McGrath) and James (Mehcad Brooks) both testified against him, united in their disgust and righteousness even if they didn’t know each other at the time. Not content with his crimes thus far or his flimsy argument of protecting humanity against the horrors of aliens, Lex felt the need to go out with a bang and poison the judge as well as the entire jury before being carted off to prison. In a way, this merely set the scene for his recruitment of the ‘Manson girl’-esque Eve and explained her original entry into CatCo. Could Supergirl really have been planning this all along? Impressive, if so. Then “The House of L” skips ahead to months ago, when Lex effectively had the entire prison under his control by way of season ticket bribes and lobster for the plebs – I mean, inmates. He then received a call from the Kaznian Embassy (what kind of terms are they on with him?) and was informed that another Supergirl with powers and no memory had emerged. Since he practically owned the prison, he just took the jet and hopped over, leaving behind a hologram to fool whoever out there might not already be on his payroll. For their part, the Kaznian government and military had been trying to train their own Kryptonian weapon only to have her lose control of her abilities and laser-eye a few soldiers to death. Oh, and she also repeatedly called out for “Alex,” which seems to be the only name she knew and quickly became something Mr. Luthor could take advantage of. You see, how was she to know the person she desperately missed and couldn’t remember was her sister and not her ‘best friend’ Lex? He convinced her of as much when he arrived on the scene, shortly after she went berserk on some criminals holding a child named Mikhail hostage. Lex offered to teach her control of her powers, and so he and the young boy became her closest allies. She was decidedly not a nice girl. And thus began Luthor’s big scheme: make the Kaznian military think he’s training their living weapon to attack the United States while simultaneously preparing to foil that attack and become an American hero. To do this, he ordered Otis to find a radical patsy – which is how Ben Lockwood entered the scene without having a clue what was going on behind the curtain. That training montage brought us to the third episode of this season, when the Red Daughter was poisoned by the Kryptonite in the atmosphere. While Lex info dumps all about her home planet, the greedy American people, and the other Supergirl she must defeat, his pet project also learned about his sister Lena and how she was a little like a replacement. In a not-so-shocking twist, Lex knew Supergirl’s identity and snuck a faux Kara into National City to show her just how lavish Kara’s life was. This was after the Kaznian girl spent some time undercover as a cocktail waitress named Linda Lee (I see you, comic book shoutout!) and witnessed firsthand the kind of sexist and disgusting men Kara supposedly defended. After a quick meeting with the real Alex (Chyler Leigh), the Red Daughter decided to peruse Kara’s diary and quickly fell in love with her friends and way of life. A follow-up conversation with Lena – and boy, is Benoist great at playing a slightly altered version of Kara just trying to fit in – convinced her that maybe Lex had it all wrong, something which he and Eve obviously could not abide. And so it was time for Plan B: killing young Mikhail and blaming it on the Americans. Thankfully, the boy didn’t have to die thanks to Otis’ one act of human kindness – but Red Daughter didn’t know that. However, this time she didn’t just accept Lex’s instructions for revenge and instead went off to wreak havoc on her own. She rejected his plans to weaponize her and demanded answers about Kara’s life and the existence of her own Alex. Was this all just an elaborate way to get back at his sister? Lex declared he was cutting ties with her, but that all changed once again when she fell ill three months ago. And so “The House of L” spins an entirely new perspective for Lex’s introduction last week. It was not himself he looked to cure, it was his Supergirl. He gave himself cancer in order to push Lena to perfect her Harun-El serum so that he could then use it to revive and strengthen the Red Daughter via a blood transfusion. Getting his own super soldier status in the meantime was just a temporary(?) bonus. In the present, Kara informs James and Alex that Lex escaped, Eve leaves a letter for an unconscious Lena, and the Red Daughter flies overhead with her own version of a supersuit meant to strike fear in the hearts of Americans. With a season-best performance from Benoist and a truly chilling villain in Cryer, it feels like this season of Supergirl has finally begun in earnest. Supergirl airs Sundays at 8/7c on the CW.